It’s still cold up in Minneapolis. 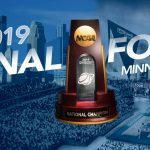 But tickets for the NCAA Final Four contests between Virginia and Auburn followed by Texas Tech taking on Michigan State at US Bank Stadium are going like hot cakes, albeit at $22,245 for a ring side seat. However, excellent lower level, center court seats can still be had for a mere $14,950, and those are going fast. You can still get good seats right behind the team benches for a little under $10,000 apiece, but I don’t think that includes parking, popcorn or beer. Corner seating, which gives you a rather long distance diagonal view of the action, can be had for between $4000-$5000 a ticket while seats behind the goal, which some fans actually like, are genuine bargains at around $400 apiece. Mezzanine seating prices around the middle level of US Bank Stadium, which they call their ‘Club Level’, range from $1707 up to $2415 per person, while the ‘cheap seats’ on the upper level all around the top can be had for under $400. The Stadium holds 66,860 fans for basketball games. If they sell out, which is likely, a bunch of money stands to be made off of these three games. Speaking of money to be made, one Texas gambler took a notion to bet on his home team back in November and put down a future wager of $1500 on Texas Tech to win the NCAA Tournament for 2019. Back then he got the Red Raiders at 200-1, therefore, should Texas Tech actually pull it off, this guy will take home a cool $300,000! Now, what was a 200-1 Texas Tech team has evolved into the number three contender left in the mix for the national title at +285. The Virginia Cavaliers are listed as tourney favorites at +110 with the Wolverines of Michigan State nipping at their heels with +140. Poor ole Auburn is listed at +500, but these Tigers just might surprise a lot of people in the next few days. Of course we first have to get through the Saturday games before knowing which teams will be competing on Monday evening at US Bank Stadium for the national title. Currently Michigan State is favored over Texas Tech by only 2.5 points while Auburn will face Virginia as 5.5 point underdogs. Tight spreads and tight games. In reality these games could go either way, so good luck wagering on them. Any way it goes, a lot of money is about to change hands.